"Donkey Kong Japan" is the original Japanese version of the game. It has a different level layout and the kill screen comes earlier (Japan ends on screen 85; US ends on 117). In addition, the barrel screens allow the player to "cheat" by holding onto the ladders with no risk of barrels rolling down onto Mario (the game code was modified to disallow this a few months after the first batch of American machines rolled out). Other than fewer barrel boards and the ladder cheat, gameplay is identical between the two versions. There is no arcade machine leaderboard for this version, competition is MAME-only, as very few Japanese Donkey Kong machines still exist. 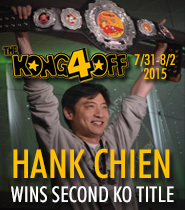 Dr. Hank Chien, the current Donkey Kong world champion, is also the world record holder on the Japanese version, with a score of 662,800. My first submitted score, in November 2011, put me in 5th place, but I returned to the game in March 2012 and moved up three spots to 2nd. Crazy Kong is the infamous rough-around-the-edges Donkey Kong "clone" developed in 1981 by Falcon. It is, for the most part, much easier than Donkey Kong, and follows the level layout of Donkey Kong Japan. Despite (or perhaps because of) its bizarre sound, graphics, and gameplay, the game has a loyal cult following. "No-Hammer" is just what it sounds like: the player is not allowed to make use of the hammer at any point in the gameplay performance. This variant is considered far more challenging than the standard hammer-allowed game, particularly on the conveyor and rivets screens, where strategy requires a highly nuanced understanding of the movements of the fire-beings. "Level 1-1" is a play variation that Twin Galaxies introduced in 2008 wherein the player attempts to score as many points as possible on the first screen. It's a lot of fun, but it's also a lottery. Achieving a "top 5" score on this variant demands a large dose of situational and random luck. I am currently ranked on five of the twelve leaderboards but plan to be on all of them eventually. The only reason I'm ranked as highly as I am on the DK Japan and Crazy Kong tracks is that several of the "elite" Kong players ignore those tracks, or haven't revisited them with their current skills. I myself could put up better scores than several I have standing, but have, in several cases, elected specifically not to do so. For example, in training for my million on DK US, I have now developed enough skill to make a run at Hank's DK Japan record, but I'm not going to. Nowadays, he (along with at least a half dozen other players) could beat his standing record easily. So to me, running in and snatching 1st would feel kind of like punching somebody in the face while they're asleep! 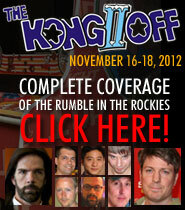 Rest assured, Hank could beat whatever I put up, so I feel that it's right for him to stay on top. A similar situation applies to Crazy Kong (MAME). 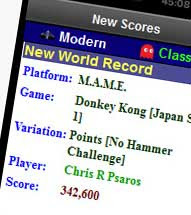 In November of 2011, Philip Tudose effectively buried CK with an absurd score of 685,200, but the game was only submitted to MAME Action Replay, and never to Twin Galaxies. So going for 1st at Twin Galaxies doesn't mean much to me, since the TG record is nowhere close to the true record. And I'll tell you right now that I'd kill off my game before taking JJ Cahill's Crazy Kong arcade machine record—anybody with the balls to get that tattoo deserves to be in 1st until the end of time. I (briefly) held the world record for a "no-hammer" performance on Donkey Kong Japan. 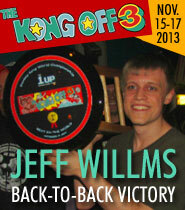 Jeff Wolfe, an active Donkey Kong competitor since the game's original release in 1981 and the player whose score I beat for the title, reclaimed the record about a month later. 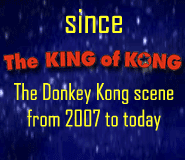 It's still my proudest Donkey Kong-related achievement, and I plan to take another shot at it. I have now kill-screened the US version, the Japanese version and Crazy Kong. My next goal is 1 million points on the US version. I have yet to be ranked on an arcade machine. I used to practice on the (rapidly and tragically aging) Donkey Kong machine at the Santa Cruz Beach Boardwalk arcade, until January 2012, when I bought one of my own. I still play on both. On September 15th, 2012, I managed to kill screen the Boardwalk machine with a score of 882,800, but was not recording (and wouldn't have been able to open up the machine for hardware verification anyway!) As for my own machine, I'm still working on getting a game on tape that would place me in the top 15 (which is my submission prerequisite). Lastly, I have no intention or interest in ever going for the "big one" (the standard-play world record on the arcade machine). The record has been pushed so close to the ceiling that trying would just make me miserable. I derived a surprising amount from Donkey Kong on my journey to my first kill screen, but aside from my gradual quest for the million, I think I'd rather stay in the real world than get too buried in this one!